This article is part II of a series of articles on sensory problems. Click here to read Part I.
Compressions are applied on the joints of the wrists, elbows, shoulders, ankles and knees. With two hands hold the two ends of the joint and compress gently ten times, count loudly to set up the child’s expectations. Example: to apply compressions on the wrist, hold the child’s hand with one hand and the child’s forearm with the other hand and gently apply the ten short compressions. Do the same with the other joints in sets of tens. For the knees and ankles have the child rest her/his foot on a chair (or in your lap) and leg should stay stretched out. According to the child’s need compressions can be repeated. Always try to tell the child ahead what is going to happen next. Preparedness and courtesy allow good cooperation to come naturally. 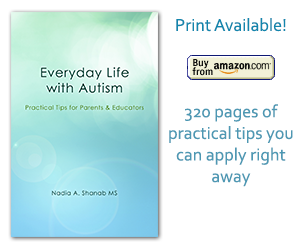 Compressions are recommended for autistic children with ADHD. They are very helpful. As soon as the child arrives in the morning, she/he gets to enjoy this short session of de-stress. Depending on the case, the child can have five minutes of massage using the massager followed by a session of compressions. Using hand massage to apply deep pressure can also be very beneficial. A combination of all three types (massager, compressions and hand massage) of tactile sensory techniques can be of a great help. Try it with any kid, and the child would tell you whether she/he likes it or not. Kids are so different when it comes to the use of a cushion on their seats. They are so divided on their preferences. Note: It is okay not to like. Remeber, if the child is going to a mainstream class, have him take the cushion along. There are so many types of bouncing ball. They are great for circle time and always useful to get the body moving. It either motivates the kids to become more active or helps them to clam them down. For most kids it is a lot of fun. It is a soft, spongy, squishy bag, big enough for a child to rest or sleep on it. Many special education classes -and some regular education classes too- have one of them. They are reserved for kids when they are really tired and need to rest and relax. Allowing the child to lay down and be in a quiet corner, even for a short period of time, can soothe and pacify her/his discomfort. Sometimes all the child might need is some stillness, space and tranquility. Set the visual timer according to the need. Taking a ten minute power nap allows all senses to rest and start afresh. Important note: Make sure to place the bean bag in a safe place with no risk of things falling on the child while she/he is resting. Immersing the hands in a bean bag and squeezing and grasping the beans repeatedly, is another way to alleviate sensory problems. Choose a container and fill it with beans (the cheapest is probably the pinto beans). Encourage under stimulated children to do this activity during play time. The feedback they get might triggers some senses and sets them going. Important note: Make sure the kids don’t eat or swallow the beans, this activity should be supervised. Another advantage of this activity: it improves fine motor skills. Usually the beans spill as the children play. Ask them to pick up every single bean and put them back in the tub. The act of picking up the beans energizes the fine motors.